Steve and I have a passion for local grown food. We love having those fresh vegies from the garden… or the thrill of washing off a vegetable right in the garden and chomping down on it. The smells are trememdous, the flavors vibrant, and there is a peace at knowing they are chemical free. Commercially grown produce, and meat is something beyond our control. There are so many factors to consider. I found a fabulous article put out by the state of Utah which worked through the analysis of why local is better. Here are a few points that resonate with me. and sustain rural communities (Gale, 1997). at large chain stores keeps only 40%. • Buying local increases our nation’s food security in the event of international conflict. 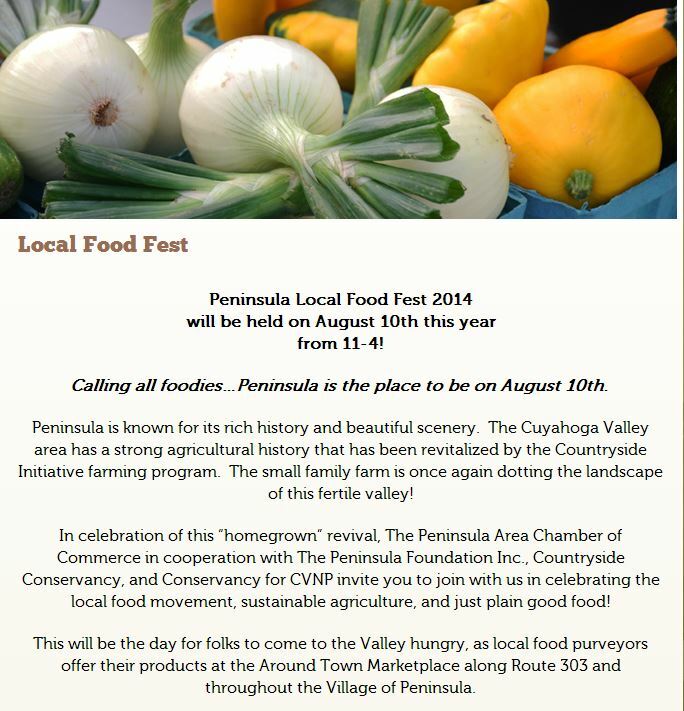 Yes, Its the Local Food Fest in Peninsula on August 10th, and we jumped at the chance. This fest will be held on Main Street in downtown Peninsula from 10a to 4pm. There are a number of local farmers, food producers, bakers, and ofcourse we will be there with our soap and scrubs. Among the vendors listed are a number of amazing fresh farm produce stands, fresh baked bread, natural dog products, and jely made from wine. We have competition in the soap because there is someone who makes soap in the shape of pierogis… ok, thats a new one.